This photograph shows a representation of Hope Partnership’s ‘model’ Ferry Road development six years after completion. Photo by Gregory Stroud. No doubt by now, most of you have heard of the Hope Partnership housing development planned for 16 Neck Road. It’s a subdivided property tucked in beside the northbound I-95 exit 70 into Old Lyme, a wooded 12.5 acre lot with a steep entrance road, and a long stretch of deep-water access to the Long Island Sound. The property once assessed for $1.2 million, was purchased by a local developer on December 31, 2015 for a relative song—$455,500. As things stand today, our expectation is that the purchaser, Graybill Properties, will keep and develop the back two lots for private houses, with river views and water access, and will sell the front two lots facing Neck Road for development as “affordable housing,” all told perhaps 37 or 41 two- three- and four-bedroom units, twelve buildings, and 113 parking spaces. The development falls under a state law, commonly known as 8-30g, which doesn’t exactly give for-profit and non-profit developers carte blanche, but it does place a heavy burden of proof on local government to stop them, if a town fails to meet a very narrowly-tailored threshold of 10 percent deed-restricted affordable housing stock. Old Lyme currently stands at 1.56 percent, and by this method of counting, it’s not at all clear that the town can or will ever meet or sustain the minimum threshold of affordability. To be sure, affordable housing has a checkered 30-year history in Connecticut, with often wealthy enclaves successfully gaming the system to shirk their statutory responsibilities, and sometimes unscrupulous developers gaming the system to build luxury apartment complexes, and harvest tax advantages, wherever profitable. In our particular case, we feel confident in saying that neither is the case, but that does not mean our current debate has not been colored on various sides by these broader frictions and frustrations. Proponents of the project have at times avoided a serious discussion of the project by out-of-hand dismissing legitimate local concerns as NIMBY (Not In My Back Yard)—a form of name-calling rather than logical argument. Opponents of the project have frequently suggested darker motives for the development, without evidence. Town leaders have pitched the project as an effective defense against less scrupulous developers, despite the obvious truth that this project will not nearly allow Old Lyme to meet its near-impossible 10 percent obligation. There has no doubt been anger and ugliness, and more than a few transitory facts and figures in and around the project. We can do better. Although we have significant and still unaddressed questions concerning the genesis of this project, the methods for choosing and advancing this project, how it fits into broader unstated plans of profit, funding, and development for Old Lyme, nevertheless we are confident that the two primary organizations behind it—Old-Saybrook-based Hope Partnership, and their statewide partner The Women’s Institute—are motived not by profit, but by a genuine, if perhaps overriding, philanthropic mission. Nor does Old Lyme—despite its reputation among some as a haven of wealth and privilege—have a history of skirting the law or blocking affordable housing projects. In fact, in this case First Selectwoman Bonnie Reemsnyder and Selectwoman Mary Jo Nosal, have invited and actively encouraged the development of this project in Old Lyme. We have little doubt that many in Old Lyme will bend over backwards to help see this project to completion. But now putting all that aside, we are left with two basic questions: Is this a ‘good’ project? And do our concerns about health, safety, or other legally reviewable matters, clearly outweigh a need for affordable housing? To the first question, we say largely not. To the second question, we say that it remains unresolved. For this reason, while we have decided to remain neutral at present on this project—we will neither promote, nor actively endeavor to block it—it is our view that the project leaves such substantial details and questions unresolved that it would constitute an act of negligence for zoning, planning, wetlands, or other town commissions to give this project approval, or even conditional approval, without significant additional scrutiny and assurances. To this end, we spent more than two hours on May 2 with board and staff members of Hope Partnership, and The Women’s Institute, which was followed by numerous hours reviewing evident and serious issues of pedestrian and traffic safety, fire code, environmental, and other concerns. We followed up with an additional nearly hour-long conversation with Kristin Anderson, the development manager for the project, as part of The Women’s Institute. We remain deeply, and sincerely troubled by the project, and the feasibility of addressing these concerns. that CTDOT will alter the traffic signs and the terminus of Exit 70 in a manner, and time, which will allow for safe vehicle access to the site. To be frank, all that we are really sure of here, is that this project has sailed through a number of planning, zoning, and wetlands meetings, with the strong backing of elected local officials, an array of ephemeral facts and arguments, an ever-growing scope, and a heck of a lot of good intentions. But for all the good intent, the stubborn present reality of this project remains an essentially regressive model of suburban tract housing, with no clear safe access on foot, by bicycle, school bus, or public transit, awash in blacktop, skirting requirements of septic within the watershed and at the mouth of the Connecticut River, exempted from requirements of open space for land which will later be developed, and by an Old Lyme Plan of Conservation and Development, which is two sentences from nonexistent. This is a project, as currently drawn, which reaches toward a lower common denominator of fire code. If requirements for sprinklers are dropped, should we cheer? It’s a plan at present, which encourages children to play inside, and burdens struggling families with the necessity of two cars. Of course, no project can meet every ideal measure, and many families happily live out their days without sidewalks and within suburban tract housing. Should we hold affordable housing to a higher standard? Aren’t affordability and good intentions, reason enough? It’s an argument more often we’ve seen used for hot dogs and hamburgers in school lunches. The reality is that 16 Neck Road is not just a housing development, it’s the entrance to the town. 16 Neck Road is the first step, a driving force, a funding source and point of leverage for a much larger unspoken and questionably-coordinated redevelopment of Old Lyme. Are we in such a rush, that without any real detail, this is how we choose to begin? Believe me, the public hearing on May 14 isn’t just another hoop, it’s the moment when Hope Partnership and the Town of Old Lyme decide whether to pull the trigger. We say, yes to affordable housing in Old Lyme, but only with a better affordable plan. “…is that this project has sailed through a number of planning, zoning, and wetlands meetings.” I’ve been on the Zoning Commission for 5 years and have no recollection of this project coming before the Commission. Mr. Stroud, I wish to clarify a couple of assertions in your Op-Ed. No proposal for this property has come before the Board of Selectmen. It is a private transaction. You stated that I invited this proposal. That is not true. If you had contacted me I would have told you what I have told those who have inquired. I am educating myself on this proposal and community concerns associated with it. We will all learn more at the required Zoning Commission Hearing. Ms. Nosal: I stand by the accuracy of my comments. Greg, THANK YOU for SE Coast’s efforts to make public the concerns and issues raised by many concerned Old Lyme residents regarding the location for this project. It would be unconscionable for our town leadership to give a speed pass to Hope Partnership and the Women’s Institute due to flawed processes and troubling lack of regard for the safety, environmental, traffic and long lasting affects a project of this scale would imprint on our hometown and residents in this location. Old Lyme is the steward of the last unindustrialized, internationally recognized major river mouths in the Western hemisphere. Our elected Old Lyme officials (Selectperson, Zoning Board and Wetlands Board) have a responsibility to gather ALL facts, plans, studies, surveys, and public comment before pushing this controversial and ill conceived plan forward. I urge all residents to attend the meeting MAY 14. Hi Christine, can you clarify how a speed pass is being given? I think I am missing some information. Thank you. I have lived right next door for 18 years and every year there is more and more traffic sailing off 95 to the beach’s. Or leaving the beach is just as bad in the opposite direction.I need to cross 156 to get to work and the people who will live at this development will also need to get to work. It will be dangerous and almost impossible at times especially weekends. The proposed access to and From will be very close to the exit 70 off ramp. This is not a good site for this kind of density that they are trying to jam into 6 acres? Really? I’m confused. What about this is being pushed through if it hasn’t been to zoning or to the Board of Selectmen yet? Why is this being painted as something the town has done wrong. The process is being followed and isn’t done yet. At this time, less than one week from the zoning meeting, plans are conception based & not to scale. The applicant is seeking approval without providing construction detail. This subdivision allows for approval without the need for DEEP approval for septic & there is no Ledge Light approval for this project yet. The original plans proposed were for 1 bedroom units. The traffic study was done in October. Wetlands tests were done in July. Sprinkler systems are not included in the plans . In the March Wetlands meeting, the engineer stated that the units were 100% affordable, this was not corrected in the April meeting, therefore, the meeting minutes that are viewed by townspeople are not reflective of the scope change of the project. At the Wetlands meeting, no one was aware of the scope changes, therefore, not aware to ask for updated information on this project. Since this project does not have to go through the same requirements as a traditional project, these issues and questions need to be addressed before an educated vote can occur. Any yes vote at this time certainly would be hasty. There are to many holes and contradictions! Much of the info is either behind closed doors or slanted. what about: Additional driveway, No State of Connecticut traffic study, fire safety, wetlands, Gateway, RT 95, no access by foot or community transportation to shopping. Affordable housing in Old Lyme sure. 16 Neck Rd. “NO”, to dangerous and to much congestion. Wrong location for Affordable housing. just my opion. Thank you for the info Christine. I can understand the concerns for sure and I have not made up my mind on this project yet. What I absolutely don’t agree with is blaming the town before the process has actually played out. That makes me wonder what the agenda of SECoast is. I’m not a fan of the emotional language that is used in their communications and the mistakes with regard to facts. Too much damage is done by flaunting opinions disguised as data. Factual corrections are encouraged, and welcome. Just post them or send them along. There is a presumption in Pansy Road, LLC, that any proposed use consistent with existing zoning will not materially and adversely affect surrounding traffic and safety. It is reasonable then to assume that approval by the Zoning Commission likewise and inevitably carries with it the presumption that the proposed development will not adversely affect surrounding traffic and safety. Indeed, after approval by the Zoning Commission, only improvements immediately adjacent to the property can be assessed to Neck Road HOPE Housing, LLC, while other improvements, including necessary traffic lights, sidewalks, realignments, barriers, property and provisions for necessary turnarounds will be assumed by the Town of Old Lyme, as well as the liability of any failure to provide a timely, and effective street design. 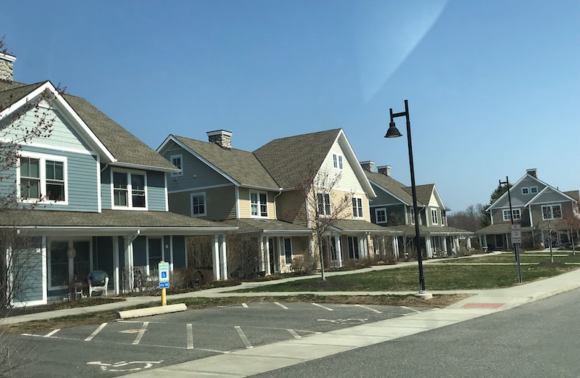 For these reasons, an approval of these applications is not simply one of many hoops, but rather marks a fundamental transfer of responsibility and liability from Neck Road HOPE Housing, LLC to the Town of Old Lyme. 1. Route 156, Neck Rd is a State highway and must receive State approval for road cuts other than single family. The State needs to review the project . The State would generally require the developer to pay for any required changes to nearby intersections and any additional traffic controls, not the Town of Old Lyme. This would include requirements for distances from intersections, sight lines based on traffic speed, pedestrian control, etc I can not see how this density could be State approved with such a short sightline.. The project should have the State’s review if not final approvals prior to the Zoning Commission’s approval. 2. Has the property been subdivided into 4 lots already? 3. I don’t see any access for the 2 Waterfront lots. I was told that they have 25ft strips for each. I believe that that would require the lots to be 1 1/2 size and the access strips don’t count. This would exceed the published acreages shown for the overall property. I was also told those lots have access along the same access as 14-1 & 14-2 Neck Rd. That is not true without the express approval from the current owner of 14-2, who is the owner in fee simple to the underlying land. If he were to allow use on his private road it would need to be shown to the Zoning Commission. Excellent clarification, Jeff. Much appreciated! It would be helpful, I think to get a clear sense of apportioned responsibility from the State along with a review/approvals. I do know that Hope Partnership has met with CTDOT about a week ago to discuss the project, but I don’t know the outcome of the meeting.